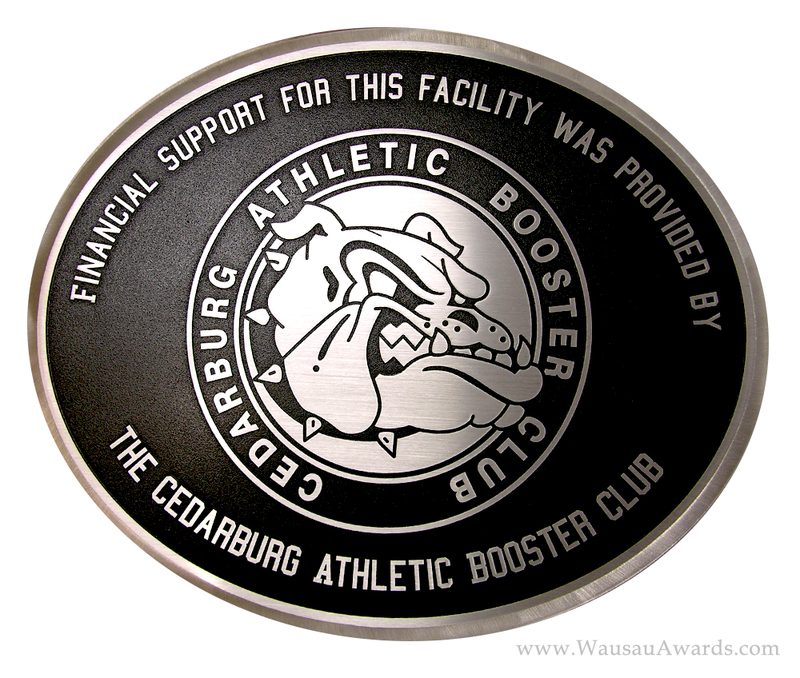 Wausau Awards & Engraving offers a variety of styles for custom made cast and precision tooled metal plaques with raised letters. These high quality pieces are perfect for recognizing individuals, capturing historic records, or dedicating a building - elegantly and permanently. They make for a lasting and memorable gift or dedication. 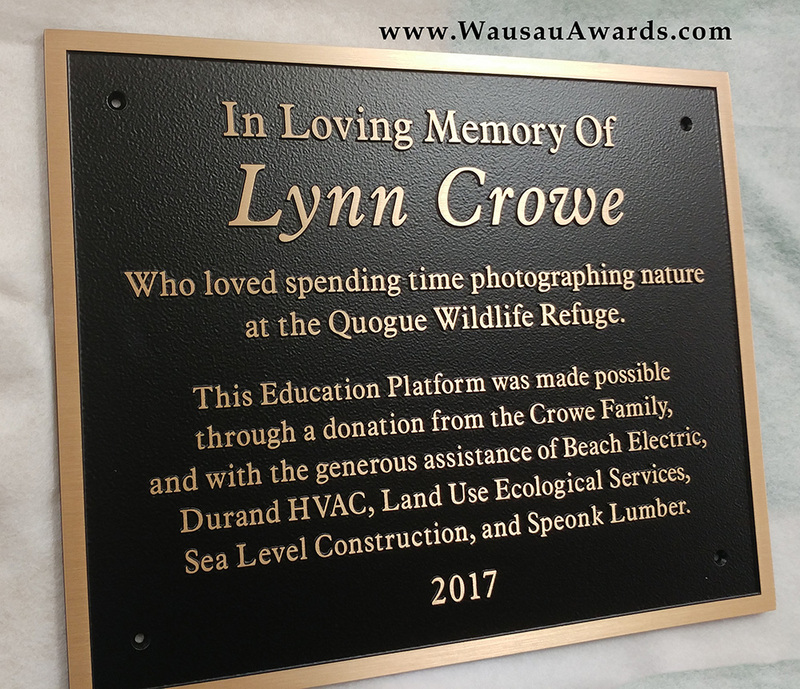 Cast bronze and aluminum plaques can be almost any size from 2" x 2" up to 64" x 40" and larger, but your amount of artwork may need to be a certain minimum size to be possible. With cast plaques and precision tooled plaques the letters are raised above the background. Etched metal plaques on the other hand, feature text and artwork that is chemically etched (recessed) into the surface of the metal, and then paint filled with a color of your choice. then 15-16 business days to ship or pickup. Rush production is not available. 1) Review the page of Ordering Options and let us know which you think are closest to your vision. We would also be glad to discuss each option with you at more length. 2) Do you have a specific or at least rough idea of the size you'd like the plaque to be? 3) Will there be text only or also logos or photos incorporated? 4) Do you have a general idea of how much text you're looking to have on the plaque? 5) Would you prefer square, circle, rectangle, oval, or some other shape? If you email or call with that information, we can pretty quickly give you a ballpark price. We'd also be glad to set up an initial proposed layout (no obligation) to see if your project can fit on a plaque of the size you intend. We can also quote you on the smallest size possible with your artwork - and then quote you the next several larger sizes up. Take a look at a few examples below (we'll be adding more from our archives of past projects almost every day this month) and contact us today for a quote or to place an order. 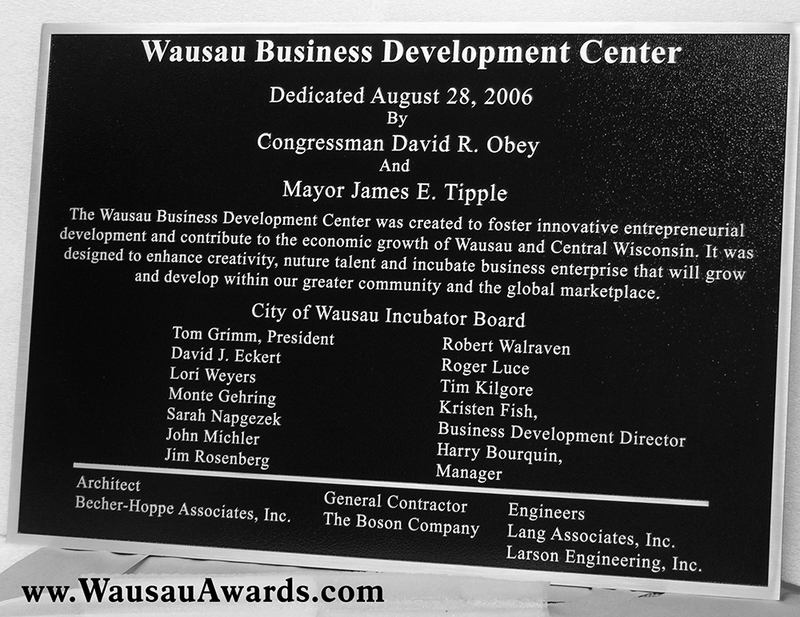 An aluminum recognition plaque for a business development center in Wausau, Wisconsin. A bronze recognition plaque for a college. 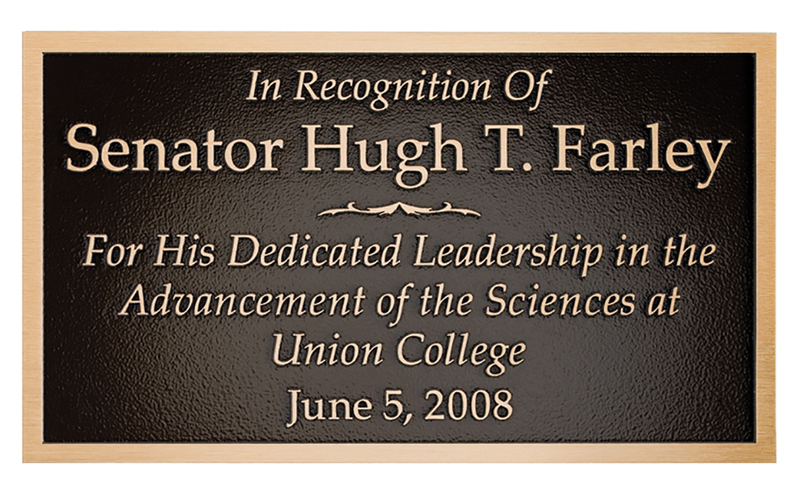 Cast bronze donor recognition plaque honoring an individual. 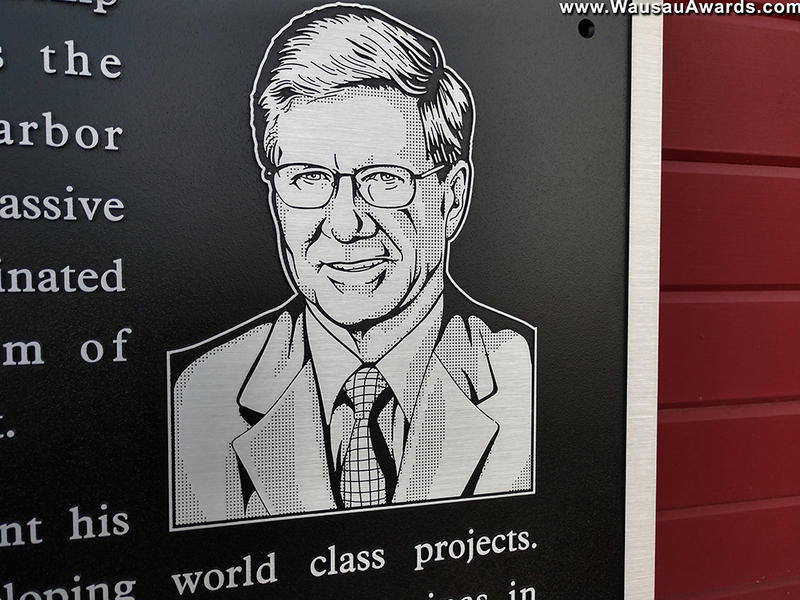 This plaque incorporates a flat relief photo which is more economical and faster to produce than a bas relief photo. 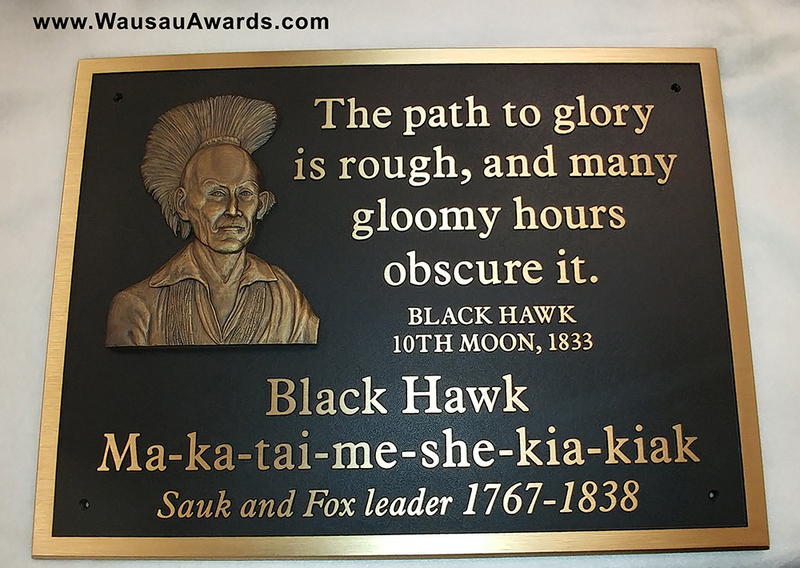 A bronze dedication plaque in recognition of Black Hawk that incorporates a bas relief photo. Note how the face looks different in the two angled photos due to how light reflects off the three dimensional surface. Because the bas relief process of adding a photo to a metal plaque involves an artist making a unique mold by hand - it may add 6-8 weeks production time. Other photo options like flat relief, chemically etched portraits, and inset photo plates would not require additional time beyond the standard 1-2 business days for design and 15-16 business days to ship. The terms Cast Plaque and Precision Tooled Plaque or Milled Plaque are used fairly interchangeably in the metal plaque industry. Precision tooled plaques look nearly identical to sand cast plaques and perform identically outdoors - and they are less expensive. 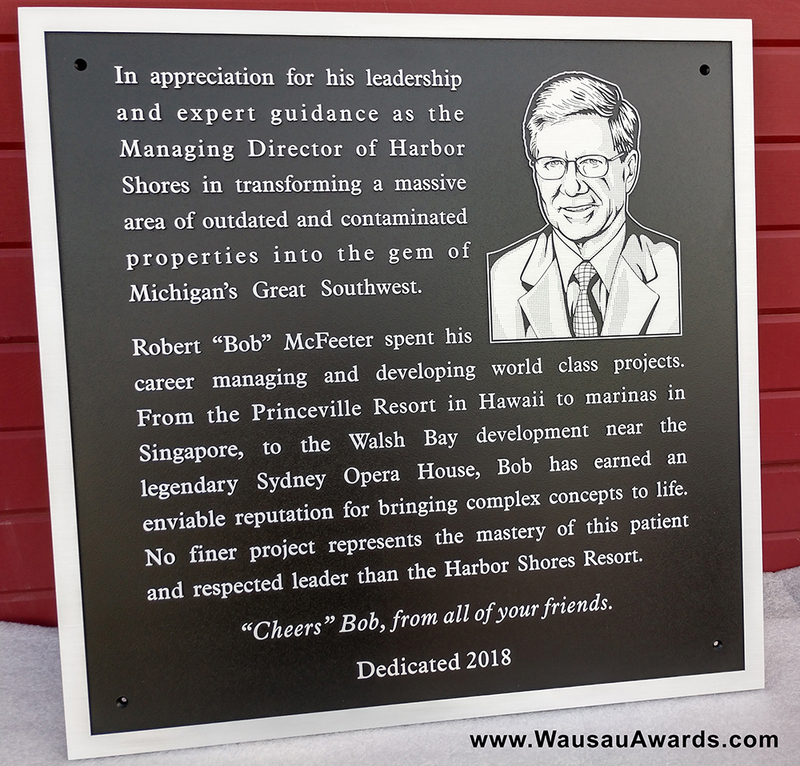 Cast plaques allow for larger sizes (up to 96") and slightly more depth and fine details but when precise dimensions and thickness are important to control - precision tooled plaques are best. In the event that your artwork would require a sand cast plaque specifically (very large, very fine details) - we can quote you on that. You can recognize a cast plaque by the slope of the letters, whereas modern tooled plaques have letters that are more vertical and crisp looking. Take a look at the Ordering Options and let us know which you think are closest to your vision. We would also be glad to discuss each option with you at more length. 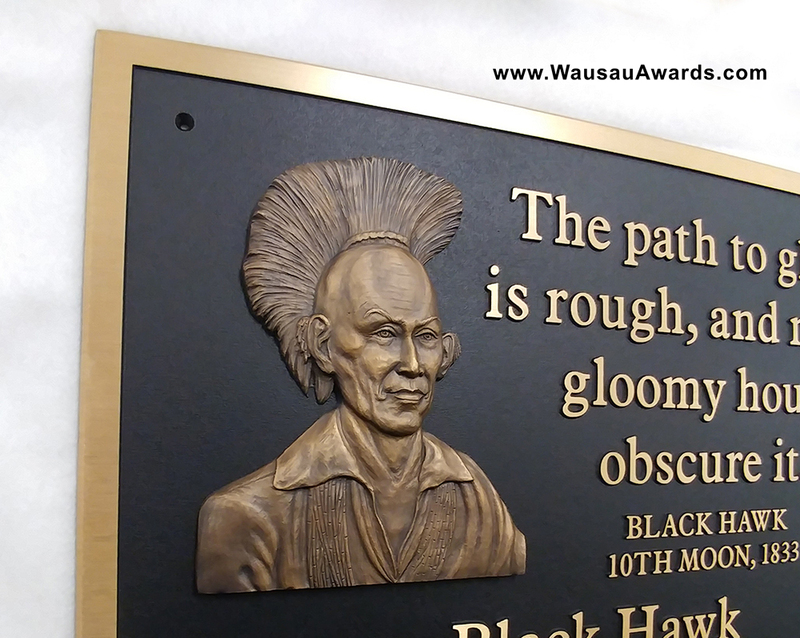 ©2019 Wausau Awards & Engraving LLC. All rights reserved.